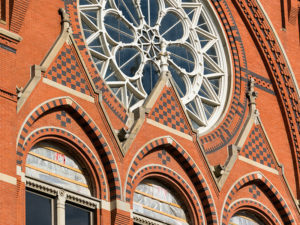 Built in 1878, Cincinnati Music Hall is an historic entertainment venue in Cincinnati, Ohio. Designed by esteemed architect Samuel Hannaford in the Venetian Gothic style, the iconic facade and hall is a National Historic Landmark. For more than a century, the building’s ornate stonework and brick masonry have towered over the storied Over-the-Rhine neighborhood. The surrounding area has experienced a Renaissance in the past decade, and the stunning facade overlooks a renovated Washington Park that has become a hub of culture and community. Over the past 140 years, Music Hall’s facade has seen both highs and lows. In the 1960s and 1970s, several botched restoration attempts took place. Harsh sand blast cleaning and poor re-pointing of the brick mortar joints did more harm than good. In addition, the bold sandstone plinths that stand at the Elm Street entry have weathered from hard Midwest winters and over-salting. With the help of Messer, PWWG, 3CDC, and the rest of the project team, SSRG is restoring Music Hall to its 19th century glory. We are patching and replacing the stone accents throughout the building by using Jahn M70 repair mortars from Cathedral Stone. 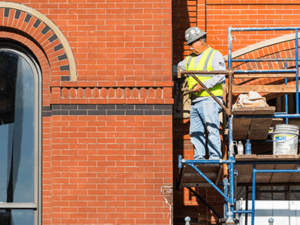 Our project vendors from Stone Center and Nawkaw are helping with the stone plinth revitalization and piano key brick stain detailing, respectively. 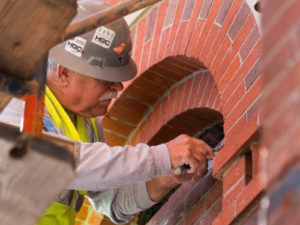 In addition, SSRG is performing stone foundation infills and brick infills throughout, to reestablish the original openings. Cincinnati Music Hall will sing again beginning Fall 2017, with an exciting Cincinnati Symphony Orchestra season. SSRG is honored to have contributed to allowing the beautiful facade to join in the celebration.